Cloves are widely recognized all over the world for their medicinal and culinary qualities. Cloves offer many health benefits some of which include providing aid in digestion, having antimicrobial properties, fighting against cancer, protecting the liver, boosting the immune system, controlling diabetes, preserving bone quality as well as fighting against oral diseases and headaches, while displaying aphrodisiac properties as well. Here’s is a comprehensive list of medicinal and health benefits of cloves along with natural remedies that will help you reap the benefits of this amazing spice. It is used to make oil, as an antiseptic and even for other medicinal purposes. Its flavor is due to the presence of a compound called Eugenol (composition varies from 70 – 90%) which has a very strong aroma. Clove is a nutrient-dense spice, to say the least. It is packed with omega-3 fatty acids, fiber, and is rich in minerals (especially Magnesium) and vitamins. Minerals found in clove include iron, magnesium, phosphorus, potassium, sodium, zinc and calcium. The vitamins in clove include thiamin, riboflavin, Vitamin C, niacin, folate, vitamin B6, vitamin B12, vitamin A, vitamin E, vitamin K and vitamin D.
Blessed with biochemicals, this multi-nutrient spice helps in improving digestion by stimulating the secretion of digestive enzymes. It also aids in reducing dyspepsia and nausea. Just roast a few clove buds and powder them. Take this powdered form of clove with honey for relief in digestive disorders. Cloves are great for men, mainly because a small amount of cloves can increase testosterone, which is why cloves works as an aphrodisiac for both men and women. Cloves provide relief from toothache and this is one of the main reasons why you will see them listed as an Ingredient in 99% of toothpastes. Ayurveda describes certain plants to be effective in developing and protecting the immune system. One such plant is clove. The dried flower bud of clove contains compounds that help in improving the immune system by increasing the white blood cell count, thereby improving delayed type hypersensitivity. Headaches can be reduced by using cloves. Make a paste of a few cloves and mix it with a dash of rock salt. Add this to a glass of milk. This mixture reduces headaches quickly and effectively. 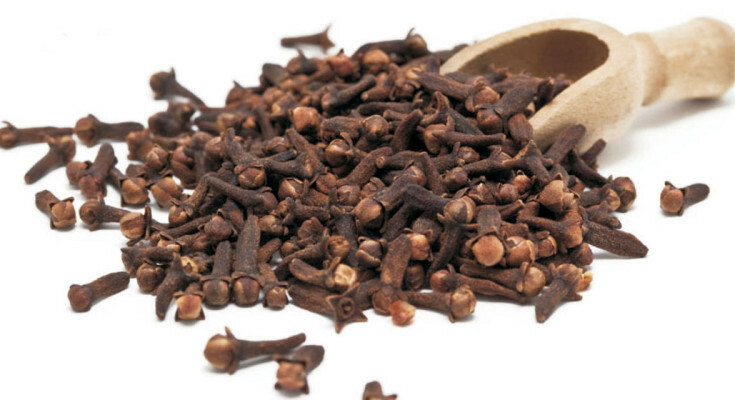 Cough and bad breath can be cured by consuming cloves. These are very common problems that we all face and can be very well treated by the consumption of cloves on a daily basis. You can do this by including them in your dishes and also as refreshments at any time of the day. Further, the spice buds contain very good amounts of vitamin A and beta-carotene levels. These compounds are known to have antioxidant properties. The body also requires vitamin-A for maintaining healthy skin and for healthy vision. Ancient Ayurveda suggests that clove should be consumed with basil, mint and grounded cardamom warm water to relieve oneself of stress. You may add honey to the mixture as well. In patients suffering from diabetes, the amount of insulin produced by the body is not sufficient or insulin is not produced at all. Studies have revealed that extracts from cloves imitate insulin in certain ways and help in controlling blood sugar levels.